The Portuguese Small Press Yearbook is part of TIPO.PT, a research project on artist’s books. Catarina Figueiredo Cardoso and Isabel Baraona conceived TIPO.PT. Catarina is the editor of the first issue of the yearbook. 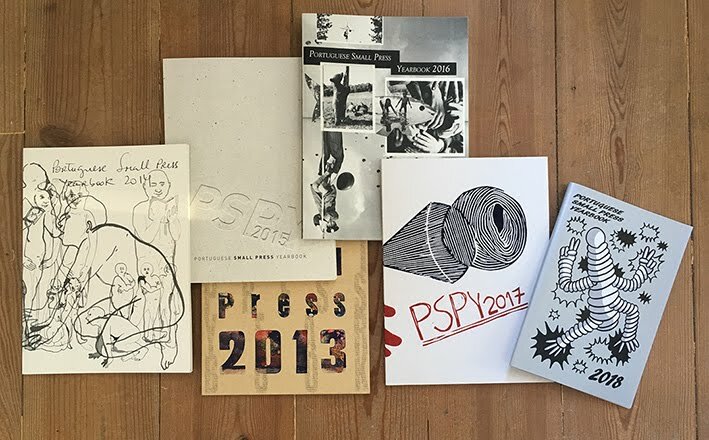 Portuguese Small Press Yearbook aims to map the Portuguese scene on artists’ books and alternative press, as well as critical and academic research on the theme. Due to the quality of the artists whom accepted to collaborate with us, we are very proud of this first issue. The yearbook contains images by Daniel Blaufuks, Carla Cruz, André Lemos, Sílvia Prudêncio and Pauliana Valente Pimentel; texts by Manuel Portela, Marie Boivent and Samuel Teixeira. The 2014 yearbook will have a theme: the collectives of artists. It will consist in interviews to the collective artists members, an analyses of their work and of course, the artists’ pages will be theirs. 200 copies, digital print P/B. Edition in Portuguese, English and French.